Extron Electronics is training on 4K technology through the Extron Institute. Coursework for the School of Emerging Technologies now addresses designing with Extron twisted pair, fiber optic, signal processing, streaming, and playback solutions for high-performance 4K signal extension, routing, and distribution systems. Instruction includes increased resolution demands, color bit-depth, frame rates, dynamic range, and the impact these have on the data rate and infrastructure components. "New displays and projectors that provide 4K and UHD resolutions are being introduced every day, and AV system designers and integrators are faced with the challenge of incorporating these new devices into a wide variety of applications," says Casey Hall, Vice President of Sales and Marketing for Extron. "The updated School of Emerging Technologies provides the in-depth instruction and practical experience needed to master these new technologies so you can become the 4K expert for your clients. 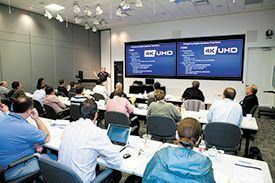 "In addition to instructor-led training, demonstrations and hands-on experience with 4K solutions allow attendees to reinforce their understanding of design concepts and techniques. The training timeline and method ensure that students are thoroughly exposed to each technology and solution before moving on to the next. Just as with other courses from Extron Institute, the School of Emerging Technologies provides continuing and renewal credits for multiple industry certifications.